Let us know how you use hot water. We'll show you models that fit your lifestyle. Upgrade your standard water heater with a new ENERGY STAR® qualified model and start saving money on your energy bill today. Our LCD display gives you the power to choose the water heating settings that fit your lifestyle. Use our new warranty check tool and determine the best next step for your water heater. Whether it's a gas or electric model, there's a Whirlpool® water heater just right for the peak demands of your household. 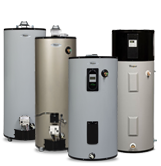 Today's units are energy-efficient, easy to maintain and outfitted with the latest innovations to provide your family with an abundant supply of hot water. Keep your water heater running smoothly with our product support guides. Choosing Whirlpool® means plenty of clean hot water - a reliable system from a brand you can trust. Learn more about how water heaters work, the latest on energy efficiency, safety features and more.